In the single-sided handouts below, nine different hearing losses are described, accompanied by information on the possible impact of hearing loss. 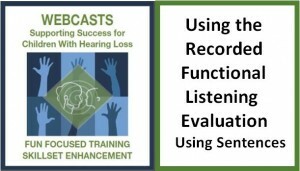 The handouts address the possible impact on speech and language, social interactions, and educational accommodations/service needs specific to each hearing loss. These handouts may be useful in understanding the impact of a hearing loss as well as for advocating for services with school or medical staff. Select the handout that represents the average range of hearing loss for your student or child. The dB levels of hearing loss are used rather than terms (i.e., minimal, mild, moderate), because these terms in no way match the seriousness of the impact that these hearing losses may have on child development, listening and learning. Any degree of hearing loss is educationally significant. My life as the only student who is hard of hearing in my school can sometimes feel like a bottomless pit of confusion. It is not always that bad, but it is a struggle. I miss a lot of sounds. I often don’t even know if I have missed a sound, sometimes at my own expense. My life at school is defined by what I hear, what I don’t hear and how I learn to cope with the differences. When I meet new people, they do not always notice my hearing aids. They often do not understand why I do things in a different way, and it may seem weird to them. They will shout at me because they think I am doing something wrong, even though it is just the way I do things. Sometimes, even when they do notice my hearing aids, they will still shout at me. They think I am just being “difficult” or I am lying about my hearing loss. They think I am dumb or don’t have any “feelings” because I can’t hear well. In school, I struggle with how some teachers act. They cannot seem to adjust to having a student who is hard of hearing. For example, even though my parents and I have asked them not to, they will do things like speak facing the board and not toward the class. The sound just bounces off the board and away from me. I can only hear a bit of what they say. I can’t understand those lone bits of sound if they don’t talk to me. Teachers will also sometimes change assignments orally and I will miss what they say. Then, when I turn in the assignment, I get marked down or get an “incompletion” grade, even if I have everything else correct. This makes me feel sad and confused because I try so hard, but I don’t seem to meet their standards. It is not that I cannot do the work, but I need to do it my way. It takes a lot of extra energy to do simple things, like listen to a lecture or take notes on a video that is not closed-captioned. If I cannot see the notes or the information the teachers are trying to pass on to me, I find it harder to understand. I have learned how to cope with the frustrations of being hard of hearing. I spend time with family and friends who understand me. I am also active in sports, like basketball, soccer and tennis, and that helps, but it is not without problems. Occasionally while playing basketball, I will receive a technical foul because I can not hear the referee, and once a soccer coach threatened to kick me off the team because I couldn’t hear him. Surprisingly, there are some advantages to being hard of hearing. When I sleep without my hearing aids, noises don’t wake me up. I sleep well and have lots of energy when I wake up. The only bad part, of course, is actually having to get up. In school, I find it easy to focus when I take my hearing aids out. Also, I can turn my hearing aids off if my parents are nagging me. Of course that just makes them mad but, after all, I am a little bit of a teenager (but not too much of one). There are advantages and disadvantages to being the only student who is hard of hearing in my school. Once I explain my hearing loss, most people understand and treat me fairly. Good teachers, good coaches and other school officials have helped me thrive. I have challenges to overcome, but so does everyone else, each in their own way. I may be the only kid who is hard of hearing in my school, but as I listen to the lone sounds of my life, they tell me I am not alone. Updated May 2017. Sincere thanks to Krista Yukow for review and revision of this web page.